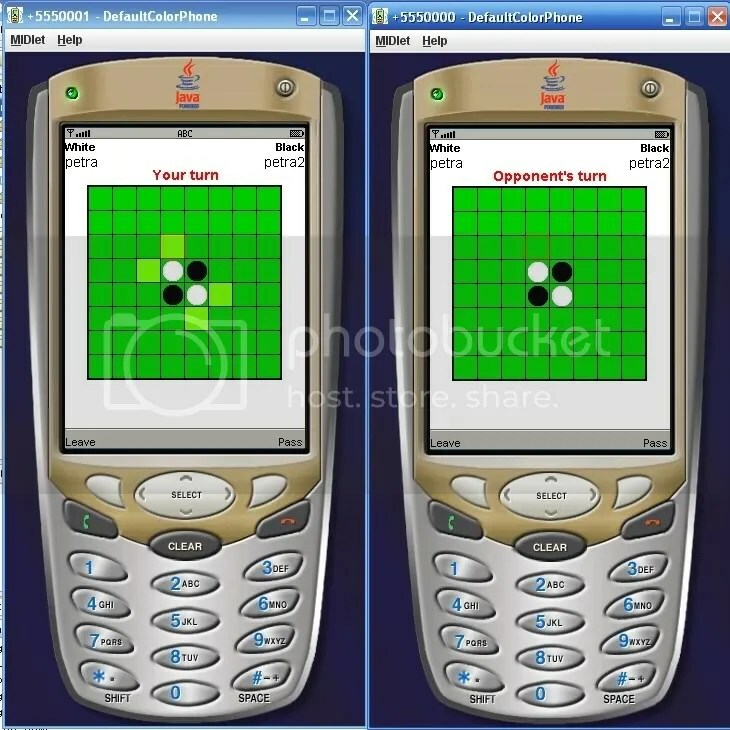 JMyMobileOthello is an online mass-player othello game played with mobile gadget. This application was developed as a requirement for assistants recruitment of Distributed System Laboratory. The application enable players to view rooms created by another players and then join the room to play. The gameplay was designed for real-time playing so the player could play like they play in real. This application consists of two packet. Client packet and server packet. And you could make either desktop application client or web applet client for the game (could be developed by any platforms). Just find the pattern at the servlet POST responses. Just to make sure, this application is not intended to real use because its features is not completely developed and still it’s lack of documentations and configurations. But it would be a nice example of Java MIDlet-Java Servlet connection. If you want to continue developing this application just let me know. Actually I didn’t have further appetite to continue this application so you could do it whatever you want as long as you tell me what you’re going to do with it. Oh, if you think the code writings is like hell, please believe me, it was a hell of 5-hours googling, 10-hours documentation reading, and 15-hours code typing. wow keren, btw gua juga pernah bikin game J2ME tipe2x gini (game binggo) cuma koneksinya gak pake http tapi pake bluetooth. kalo mau mungkin lo bisa tawarin ke perusahaan-perusahaan (ie. Jatis), sapa tau bisa dikembangin lebih lanjut dan jadi duit .. he3x..
publish di http://www.gamedevid.org gih.. masukin ke Image Gallery aja..
Keren din, makasih yah… aku mo pelajari source mu 😛 mastah kali lah kk yang satu ini, ajari awa yang masih cupu ini.